Four time Euro Bowl champion Raiffeisen Vikings celebrate their 43-7 Semi Final win over the Finnish Champion Seinäjoki Crodiles and their advancement to the Euro Bowl final for the 5th straight year and 7th overall. The game in Vienna began with nervous play on both sides of the ball with both team giving up early fumbles. An early bad snap over QB Phillip Jobstmann gave the Finnish team field position on the Viking 13 yard line. Four plays later the Crocodile’s Team Ivalo punched in their first and only score of the game. The physical Finnish team looked to steal a win, but it was not to be their day in front of the 3500 Vikings fans at the Hohe Warte Stadium. After the Vikings settled down they got on the scoreboard with a short pass to Jakob Altersberger, who in turn made a defender miss and ran in for a 41 yard TD. 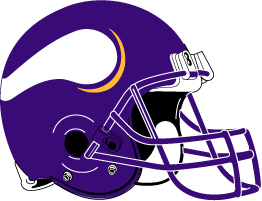 Following the defensive effort by the Vikings, who created three turnovers and limited the Crocodiles offense to just 166 yards of total offense, the Viking offense came to life and cranked out 302 rushing yards lead by the big plays from DB Josiah Cravalho (2 TD’s) who replaced injured RB Clinton Graham (1TD’s) in the second half. Both rushers ended the day with over a hundred yards rushing. Shawn Leever added a spectacular 90 yard kickoff return, Pasha Asiladab logged at 13 yard TD receptions, and Peter Krambergers hit his first FG of the year. 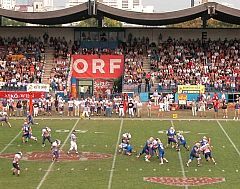 Austrian QB Phillip Jobstmann notched his second consecutive start for the Vikings (and win), replacing injured QB Luke Atwood. His performance matched that of the Bergamo game and he finished the day with an effecient 17-12 passing for 133 yards and 2 TD’s. The Vikings will now advance to the Euro Bowl Final to meet the Swarco Raiders in an all Austrian Final. Vikings-Philipp Jobstmann 2-0; Josiah Cravalho 1-0. 3  Edmund Hillery          5    4  7.0  2.5/6    . .     .      .    .      .     .
16 Esa Katila              6    . 6.0     .     .   .    1-9     . 1      .     .
26 Tuomas Leinonen         5    . 5.0     .     .   .     .      1    .      .     .
45 Efe Evwaraye            3    1  3.5     .     .  1-0   1-8     .    .      .     .
42 Pekka Rantala           3    1  3.5     .     .   .     .      1    .      .     .
55 Samo Juppo              3    . 3.0     .     .   .     .      .    .      .     .
54 Thomas Ceken            2    1  2.5  1.0/4    . .     .      .    .   1.0/4    . 9  Jaakko Rinta-Saenti     1    1  1.5     .     .   .     .      1    .      .     .
87 Jukka Satola            1    . 1.0     .     .   .     .      .    .      .     .
91 Toni Hanka              1    . 1.0  1.0/1    . .     .      .    .      .     .
17 Steve Panella           1    . 1.0     .     .   .     .      .    .      .     .
75 Jukka Tietaevaeinen     . 1  0.5     .     .   .     .      .    .      .     .
92 Lauri Happonen          . 1  0.5     .     .   .     .      .    .      .     .
99 Heikki Seikkula         . 1  0.5  0.5/2    . 1-0    .      .    .      .     .
71 Jarmo Rintanen          . 1  0.5     .     .   .     .      .    .      .     .
10 Philip Stojaspal        6    7  9.5     .     .   .     .      .    .      .     .
7  Johannes Neusser        6    1  6.5  1.0/3    . 2-0    . 1    .      .     .
56 Philip Bickel           2    6  5.0     .     .   .     .      .    .      .     .
8  Roman Floredo           4    1  4.5     .     .   .     .      .    .      .     .
31 Mario Floredo           3    1  3.5  1.0/5    . .     .      .    .      .     .
94 Florian Gruensteidl     3    . 3.0  2.0/9    . .     .      .    .   1.0/6    . 6  Mike Salerno            2    2  3.0     .     .   .     .      1    .      .     .
90 Michael Dawodu          2    1  2.5     . 1   .     .      .    .      .     .
97 Alexander Taheri        2    . 2.0     .     .   .     .      .    .      .     .
4  Johannes Bintinger      2    . 2.0     .     .   .     .      .    .      .     .
23 Florian Hiess           1    1  1.5     .     .   .     .      .    .      .     .
21 Thomas El-Badramani     1    1  1.5     .     .   .     .      .    .      .     .
69 C.Augenschein           1    . 1.0     .     .   .     .      .    .      .     .
24 Bogdan Kasterovic       . 1  0.5     .     .   .     .      .    .      .     .
3  Pasha Asiladab          . 1  0.5     .     .   .     .      .    .      .     .
34 George Thomas           . 1  0.5     .     .   .     .      .    .      .     .
92 Armin Novidi            . .   .      .     .  1-49   .      .    .      .     .
75-J.Tietaevaeinen, 85-A.Westerlund, 87-J.Satola, 91-T.Hanka, 92-L.Happonen, 99-H.Seikkula. 1-5; Christoph Gross 1-minus 4. PASSING: Crocodiles Seinajoki-Chris Brown 2-7-0-7; Ma.Rissanen 0-1-0-0. Vienna Vikings-Philipp Jobstmann 12-17-1-133; Christoph Gross 1-8-1-28. INTERCEPTIONS: Crocodiles Seinajoki-Esa Katila 1-9; Efe Evwaraye 1-8. Brown 1-0. Vienna Vikings-Philipp Jobstmann 2-0; Josiah Cravalho 1-0. George Thomas 0-1; Bogdan Kasterovic 0-1; Pasha Asiladab 0-1. C 1-10 C30   CRO      3 now wearing 10. C 1-10 C30   VIK ball on VIK30. C 1-10 C37   C.Brown rush for 25 yards to the VIK38, 1ST DOWN CRO (J.Neusser). C 1-10 V38   C.Brown rush for 4 yards to the VIK34 (M.Floredo). C 2-6  V34   Timeout Crocodiles Seinajoki, clock 10:52. C 2-6  V34   Mi.Rissanen rush for 2 yards to the VIK32 (R.Floredo). C 3-4  V32   Mi.Rissanen rush for 3 yards to the VIK29 (P.Bickel). C 4-1  V29   E.Hillery rush for 3 yards to the VIK26, 1ST DOWN CRO (R.Floredo). C 1-10 V26   G.Sey rush for loss of 5 yards to the VIK31 (M.Floredo). C 2-15 V31   C.Brown pass incomplete to Ma.Rissanen. C 3-20 V36   C.Brown pass incomplete to M.Kujala (J.Neusser). C 4-20 V36   J.Satola punt 35 yards to the VIK1, downed. V 1-10 V01   VIENNA VIKINGS drive start at 07:39 (1st). V 1-10 V01   F.Hiess rush for 2 yards to the VIK3 (S.Juppo). V 1-10 V35   Fumble by P.Jobstmann, fumble by recovered by CRO E.Evwaraye at VIK13. C 1-10 V13   CROCODILES SEINAJOKI drive start at 06:06 (1st). C 1-10 V13   T.Ivalo rush for 2 yards to the VIK11 (P.Bickel;M.Salerno). C 2-8  V11   C.Brown rush for 1 yard to the VIK10 (M.Floredo;R.Floredo). C 1-G  V02   T.Ivalo rush for 2 yards to the VIK0, TOUCHDOWN, clock 04:21. V 1-10 V41   VIENNA VIKINGS drive start at 04:15 (1st). holding (S.Robinson) 3 yards to the VIK42, NO PLAY. V 2-9  V42   C.Graham rush for 3 yards to the VIK45 (P.Rantala). V 4-1  V50   C.Graham rush for no gain to the 50 yardline (E.Hillery). C 1-10 C50   CROCODILES SEINAJOKI drive start at 02:07 (1st). C 1-10 C50   Fumble by C.Brown, fumble by recovered by VIK J.Neusser at CRO49. V 1-10 C49   VIENNA VIKINGS drive start at 02:02 (1st). V 1-10 C49   C.Graham rush for 8 yards to the CRO41 (P.Rantala;E.Evwaraye). 1ST DOWN VIK, TOUCHDOWN, clock 01:19.
to the CRO35, fumble by T.Leinonen recovered by VIK J.Neusser at CRO35. V 1-10 C35   VIENNA VIKINGS drive start at 01:12 (1st). V 1-10 C35   PENALTY VIK false start (R.Seybold) 5 yards to the CRO40. V 1-15 C40   Fumble by P.Jobstmann, fumble by recovered by CRO H.Seikkula at VIK48. C 1-10 V48   CROCODILES SEINAJOKI drive start at 01:06 (1st). recovered by VIK A.Novidi at VIK32, A.Novidi for 49 yards to the CRO19. V 1-10 C19   VIENNA VIKINGS drive start at 00:27 (1st), VIK ball on CRO19. V 1-10 C19   C.Graham rush for loss of 1 yard to the CRO20 (E.Hillery). V 2-11 C20   Start of 2nd quarter, clock 12:00. V 3-9  C18   C.Graham rush for loss of 3 yards to the CRO21 (E.Hillery). V 4-12 C21   P.Kramberger field goal attempt from 38 GOOD, clock 10:26. C 1-10 C26   CROCODILES SEINAJOKI drive start at 10:14 (2nd). C 1-10 C26   T.Ivalo rush for 3 yards to the CRO29 (P.Stojaspal;P.Bickel). C 2-7  C29   C.Brown rush for loss of 3 yards to the CRO26 (J.Neusser). C 3-10 C26   E.Hillery rush for 2 yards to the CRO28 (P.Stojaspal;P.Bickel). C 4-8  C28   J.Satola punt 19 yards to the CRO47, out-of-bounds. V 1-10 C47   VIENNA VIKINGS drive start at 08:17 (2nd). V 1-10 C47   C.Graham rush for 2 yards to the CRO45 (E.Katila). V 2-8  C45   P.Jobstmann pass incomplete to S.Robinson. V 1-10 C37   C.Graham rush for 5 yards to the CRO32 (E.Evwaraye). DOWN VIK, TOUCHDOWN, clock 05:43. C 1-10 C40   CROCODILES SEINAJOKI drive start at 05:32 (2nd). C 1-10 C40   Ma.Rissanen rush for 3 yards to the CRO43 (R.Floredo). C 2-7  C43   Ma.Rissanen rush for 2 yards to the CRO45 (P.Stojaspal). C 3-5  C45   E.Hillery rush for no gain to the CRO45 (M.Dawodu). CRO42, fumble by J.Cravalho recovered by VIK G.Pachmann at CRO40. V 1-10 C40   VIENNA VIKINGS drive start at 03:26 (2nd), VIK ball on CRO40. V 1-10 C40   C.Graham rush for 7 yards to the CRO33 (T.Leinonen). P.Jobstmann pass attempt failed (intercepted). C 1-10 C28   CROCODILES SEINAJOKI drive start at 03:03 (2nd). C 1-10 C28   C.Brown pass incomplete to J.Rautiainen. C 2-10 C28   C.Brown pass complete to Ma.Rissanen for loss of 1 yard to the CRO27. C 3-11 C27   C.Brown rush for 6 yards to the CRO33 (M.Floredo). C 4-5  C33   Timeout Vienna Vikings, clock 01:57. C 4-5  C33   J.Satola punt 44 yards to the VIK23, downed. V 1-10 V23   VIENNA VIKINGS drive start at 01:45 (2nd). V 1-10 V23   P.Jobstmann pass incomplete to S.Robinson. V 1-10 V33   PENALTY VIK delay of game (P.Jobstmann) 5 yards to the VIK28. V 1-15 V28   C.Graham rush for 9 yards to the VIK37 (E.Katila). V 2-6  V37   Timeout Vienna Vikings, clock 01:25. V 1-10 C24   P.Asiladab rush for 5 yards to the CRO19 (E.Hillery;T.ceken). V 2-5  C19   Timeout Vienna Vikings, clock 00:36. V 1-G  C10   P.Jobstmann pass incomplete to S.Robinson (T.Leinonen). V 2-G  C10   P.Jobstmann pass incomplete to J.Altersberger (J.Rinta-Saenti). yards to the CRO10, out-of-bounds (F.Hiess). C 1-10 C10   CROCODILES SEINAJOKI drive start at 00:09 (2nd). C 1-10 C10   C.Brown rush for loss of 2 yards to the CRO8. C 2-12 C08   End of half, clock 00:00. C 2-12 C08   Start of 3rd quarter, clock 12:00, CRO ball on CRO30. C 1-10 C27   CROCODILES SEINAJOKI drive start at 11:34 (3rd). C 1-10 C27   Ma.Rissanen rush for 12 yards to the CRO39, 1ST DOWN CRO (M.Salerno). C 1-10 C39   T.Ivalo rush for 4 yards to the CRO43 (P.Stojaspal). C 1-10 C50   Ma.Rissanen rush for 5 yards to the VIK45 (P.Stojaspal). C 2-5  V45   T.Ivalo rush for 3 yards to the VIK42 (P.Stojaspal;P.Bickel). C 1-10 V25   Mi.Rissanen rush for no gain to the VIK25 (P.Stojaspal). C 2-10 V25   Ma.Rissanen rush for 4 yards to the VIK21 (J.Neusser;P.Stojaspal). C 3-6  V21   PENALTY CRO false start (Ma.Rissanen) 5 yards to the VIK26. C 3-11 V26   E.Hillery rush for no gain to the VIK26 (M.Dawodu;P.Stojaspal). C 4-11 V26   C.Brown pass incomplete to Ma.Rissanen (M.Salerno). yards to the VIK22 (E.Hillery;H.Seikkula). C 1-10 C29   CROCODILES SEINAJOKI drive start at 04:45 (3rd). C 1-10 C29   T.Ivalo rush for 17 yards to the CRO46, 1ST DOWN CRO (A.Taheri). C 1-10 C46   C.Brown rush for loss of 3 yards to the CRO43 (F.Gruensteidl). C 2-13 C43   T.Ivalo rush for 2 yards to the CRO45 (A.Taheri). C 3-11 C45   C.Brown sacked for loss of 6 yards to the CRO39 (F.Gruensteidl). V 1-10 V43   VIENNA VIKINGS drive start at 02:14 (3rd). V 1-10 V43   C.Gross pass incomplete to S.Robinson. holding (R.Meklau) 3 yards to the CRO28, NO PLAY. V 1-10 C15   Start of 4th quarter, clock 12:00. C 1-10 C34   CROCODILES SEINAJOKI drive start at 11:48 (4th). C 1-10 C34   C.Brown rush for no gain to the CRO34 (P.Stojaspal;P.Bickel). C 2-10 C34   C.Brown rush for loss of 1 yard to the CRO33. C 3-11 C33   Ma.Rissanen rush for 1 yard to the CRO34 (R.Floredo). C 4-10 C34   J.Satola punt 51 yards to the VIK15, downed. V 1-10 V15   VIENNA VIKINGS drive start at 09:47 (4th). V 1-10 V15   C.Gross pass incomplete to D.Kovacs (P.Rantala). V 2-10 V15   F.Hiess rush for 8 yards to the VIK23 (E.Katila). V 1-10 C49   F.Hiess rush for 6 yards to the CRO43 (E.Katila). V 2-4  C43   R.Meklau rush for 5 yards to the CRO38, 1ST DOWN VIK. V 1-10 C38   C.Gross pass incomplete to M.Thaller. V 2-10 C38   F.Hiess rush for 29 yards to the CRO9, 1ST DOWN VIK (T.Leinonen). V 1-G  C09   C.Gross pass incomplete to M.Koessler. V 2-G  C09   F.Hiess rush for 3 yards to the CRO6 (S.Panella). V 3-G  C06   C.Gross pass incomplete to M.Koessler. V 4-G  C06   C.Gross sacked for loss of 4 yards to the CRO10 (T.ceken). C 1-10 C10   CROCODILES SEINAJOKI drive start at 06:23 (4th). C 1-10 C10   Ma.Rissanen rush for 3 yards to the CRO13 (J.Bintinger). C 2-7  C13   T.Ivalo rush for 1 yard to the CRO14 (F.Gruensteidl). C 3-6  C14   C.Brown pass incomplete to A.Westerlund. V 1-10 C21   VIENNA VIKINGS drive start at 04:43 (4th). V 1-10 C21   F.Hiess rush for 2 yards to the CRO19 (E.Hillery). V 2-8  C19   C.Gross pass incomplete to P.Tusch. yards to the CRO21 (T.El-Badramani). C 1-10 C21   CROCODILES SEINAJOKI drive start at 03:48 (4th). C 1-10 C21   Mi.Rissanen rush for 3 yards to the CRO24. C 2-7  C24   T.Ivalo rush for 7 yards to the CRO31, 1ST DOWN CRO (J.Bintinger). C 1-10 C31   Ma.Rissanen rush for 5 yards to the CRO36 (J.Neusser). PENALTY VIK offside defense declined. C 1-10 C44   Ma.Rissanen pass incomplete to A.Westerlund, dropped pass. offside defense 5 yards to the CRO49, NO PLAY. C 2-5  C49   Ma.Rissanen rush for no gain to the CRO49 (P.Stojaspal). C 3-5  C49   T.Ivalo rush for 5 yards to the VIK46, 1ST DOWN CRO (J.Neusser). C 1-10 V46   Mi.Rissanen rush for 1 yard to the VIK45 (C.Augenschein). C 2-9  V45   End of game, clock 00:00.